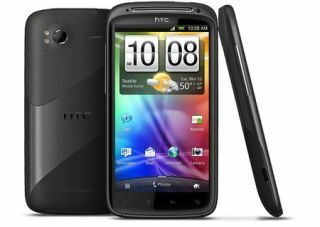 HTC unleashes Sensation smartphone | What Hi-Fi? HTC's just unwrapped its latest smartphone – the Sensation. Running Android 2.3.3 (the latest version of Gingerbread) at launch, it has a Qualcomm dual-core 1.2GHz engine, backed up with 768MB of RAM. Fronted by a 540x960 piece of 4.3in Gorilla glass and backed by an 8MP dual-LED flash camera, it's wrapped in an aluminium unibody shell. HTC has also updated its Sense UI for the Sensation and added HTC Watch, a movie streaming service and app. The latter offers progressive downloads, so you can begin watching rented or bought content instantly while the rest streams from the internet in the background. There's 1080p video recording, an HDMI output through the micro-USB port and front-facing VGA camera. But some might be disappointed by the 1GB of memory with a microSD card, as earlier rumours had suggested there might be 4GB of internal memory. Vodafone has confirmed it will be the launch network for the phone. If you want one, you'll have to wait until mid-May. • In a separate development, Samsung has announced its new Galaxy S2 smartphone, unveiled at Mobile World Congress in February, will be available in the UK from May 1st.